Follow the story of a family's new home centered upon a perfect lawn. The passage of time finds the house eventually empty and overgrown by the uplifting power of nature. Written by Pulitzer Prize winner Ted Kooser and wonderfully illustrated by Nucleus favorite Jon Klassen, this new release is a poignant tale of loss, change, and nature's quiet triumph. Nucleus welcomes artist Jon Klassen greeting fans and signing copies of this and his previous books in addition to exclusive Nucleus art prints. Framed reproductions from the new book will be on display and available for purchase. 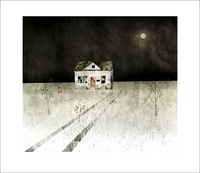 Special Offer: Attendees who purchase a copy of House Held Up by Trees during the event, receive $5 OFF a Jon Klassen art print of their choice. 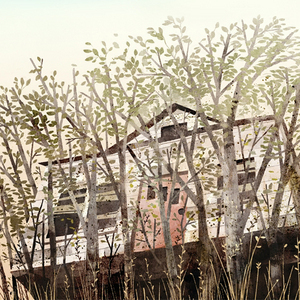 Jon Klassen has worked as an illustrator for editorial pieces, music videos, and feature films such as Coraline. He received Canada's prestigious Governor General's Award for Illustration for his picture book Cats' Night Out by Caroline Stutson and is the author-illustrator of I Want My Hat Back. Originally from Niagara Falls, Ontario, Jon Klassen now lives in Los Angeles.